Nine strikes… and they’re out! That headline pic is one of the few I intend to show you of procedures carried out last Thursday. The diagonal slashes represent well over an hour’s work to remove all remaining teeth in my upper jaw. Initial consultation with the very professional and rather charming Dr. Dimitrios Stougiannos had created much confidence and the will to part with over a year of income. A day in the chair with his likewise professional and charming team was well under way. There are links to Dimitrios, his double MSc and his thousands of previous implants here and here. I am aware that some of you will be of a nervous disposition in the vicinity of dental discussions. Even more so in the confines of the dental surgery itself. So I shall spare you a graphic account of what went on and replace it with some… er… graphics. Hope that’s clear. A picture paints a thousand words. As David Gates and Telly Savalas would be keen to remind us. What happened to me after the old stumps were pulled is expressed below through the power of further representations involving no upsetting garish colour or glimpses of gore. Essentially, there are four implants drilled into my jaw, some granules of cowbone to fill in and establish themselves in any extra spaces. Stitching to close the wreckage as neatly as possible. And then an acrylic prosthetic arrayed with the equivalent of twelve teeth labelled ‘U’ for upper was screwed into place. To complete the team sheet, I must add that Emma and Lisa were there to mop up fluids, provide timely equipment delivery and to generally massage my ego by constantly telling me how well I was doing! By late afternoon I was home with a dispensed prescription for antibiotics and fond thoughts of the next dose of analgesics to be taken. It had been a fair old lot of bother but no-one had come out of it too badly. My experience should reassure some but, even if you still don’t relish the process, there are strong indications that the final result is worth the trauma which I did not feel. I’m pretty sure that mild sedation is available for those less sanguine than me. Mrs. Cheoff noticed the onset of swelling after a couple of days. With an, “Ooh, you look like Deputy Dawg!” she gave the game away. I must correct her comparison’s accuracy with the appropriate cartoon figure below. That bruising is already dispersing. 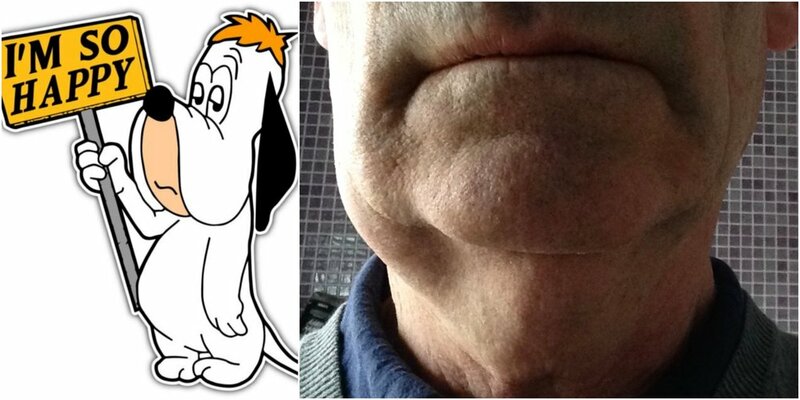 So I’ve gone from Gummy to Droopy and on to Happy. It’s early days. Things must be given the chance to settle down and heal before a final, permanent set is fixed but if all carries on in the same vein I’m a couple of months away from being more dangerous in the chomping and chewing regions than I have been for years. In efforts to put cheoff (who is a Geoff but not a chef) dotcom back on a culinary track I’ll be back with a résumé of the soft, verging on liquid, foods which I’ve been enjoying (yes, honestly!) very soon. Until then, so long… which I am already able to say with nothing but a small trace of sibilant lisping and whistling. And a final thank you to Dimitrios and his fine team!